New to site, GPS questions. I'm in the final stages of rebuilding my rock buggy, and I want to make it as robust as I possibly can, this has led me to question my GPS solution. I have been depending on a Garmin 60csx, its a great little unit, but its getting a little dated and I want something a little more user friendly with up to date map info. I've been doing some research and here are the 3 or 4 solutions I have come up with besides buying a new handheld Garmin. 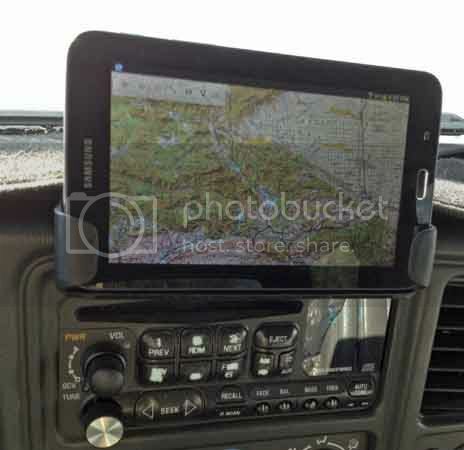 Solution 1 Ipad 2 or better with GPS (3g or 4g model), in a RAM mount or similar, mounted to the dash. I have heard good things about going this route, I HATE Apple but I have always said the do make a nice product. Solution 2 Android tablet or phone, this is basically the same as solution 1 just with android instead of Apple . Solution 4 HDMI stick PC (Intel compustick, or android stick) with GPS antenna and 5" touchscreen. I have access to all this hardware, except the GPS antenna, I would need to purchase this. When you say rock buggy I'm seeing something without any enclosed environment, as in it's going to be dusty when your in the dust, wet or damp when your in the rain or a drizzle, etc??? If this is the case, I think what you have to pick from is narrowed down by what form of protection you can expect. Your standard household tablet is not very well built to cope with moisture, dust, or vibration. In a typical passenger vehicle, that is okay as it's climate controlled and enclosed. In a rock buggy, sounds like hell for electronics. That is where dedicated GPS units typically stand out. They are usually built much better, except for this latest crop of in car units. Handheld units typically maintain the standard of being well sealed and shock resistant. Your solution 1: I have an iPad, Android is better for this stuff in my opinion. iPad will do the task but it's not nearly as versatile if you want to do something techie like feed in OBDII data or tie in a ham radio data or goofy stuff like that. Your solution 3: Been there, tried that. Pain in the *** in a passenger vehicle let alone a rock buggy. Cords everywhere, big floppy screen never quite where you want it. No, just...no. Your solution 4: Sounds hack. If you like to screw around with that kind of stuff on a tech nerd level it might be fun. I don't see it being reliable. I don't see those sticks coping with dust and moisture any better than a tablet either. Lowrance Baja units also come to mind. They are solid navigation units actually made for off road vehicles, but I'm betting you won't be happy with them because the software is not as user friendly. Very solid, but not simple. They are also quite expensive. If exposed to the elements, a rugged handheld hard mounted in a RAM cradle is hard to beat. I had a bare bones old school Garmin 72 mounted in my Bronco like that, loved it. Nice big digital speed, would show the time, and recorded a tracklog, and that was about all. If I ever get back on the project again, I might just do the same with a newer unit. I don't like to have multiple systems to update, configure etc. so I just use my phone with BCNav on it. I like having GPS overlay the USGS 7.5 minute maps instead of the less accurate proprietary maps from Magellan, Delorme, Garmin. I also have my tablet as a duplicate/backup and hardcopy paper maps to review while at camp as well. But while driving on the trail I just have my phone mounted up by my rear view mirror for quick glances at the map. It's good to have all kinds of navigation available but your main focus should be on the road while moving. I bust out the tablet or paper maps while stopped on breaks to navigate and find out where I'm going. Then the phone map while driving isn't for route finding, it's just for keeping on the path planned out earlier while stopped. A Garmin 62s and Garmin's Basecamp route planning software works for me. The gps can show me where I'm at, point me with directions to where I want to go and if I have tracking turned on and displayed, where I've been all at the same time. I always set the off route warning to 'Prompt'. I never let the gps recalculate my planned routes. An Android tablet. Only the mount, case (or not) and app remain to be decided. Rock crawling isn't as harsh as desert off roading. Your tablet will be fine. I don't think you need a case if you have a roof, but water would be the reason to get one more than dust. Of course I'm biased, but when you add up what you need to get to make a tablet work for off-road navigation, our price is very reasonable. Can the TRX also function as a road based GPS? I'm also looking for a better solution and the TRX has caught my attention. I've got a Magellan Roadmate in one of my cars now and its ok for street use but not for off pavement. I had a Lowrance Baja which had a great display but no aftermarket support and about four Garmins but I'm not real happy with them for a variety of reasons. I am considering a 276CX but I understand that its not really ready for prime time as so many Garmin products are when they introduce them. Once (or if) they get the bugs worked out it may be fine but I'm looking at alternatives. I like the size of the TRX and would be mounting it in a Land Rover Defender for use as an all around device. Time to start reading some reviews. In the today's technological world, there is a GPS device for navigation is indispensable. I use a "Garmin Foretrex 401" for the hunting trip. My favorite of Garmin products. You can visit my blog to read more about them. But if I had to choose a GPS device to navigate for "rock buggy," I will consider buying a "Magellan eXplorist TRX7"
We just added street navigation with the last software update on 27 December. We're adding the ability to search for an address with a sustaining update in about a month. The TRX7 is a great device, but the real value is in the map that comes with it. Updates to both the map and software are free and occur over wifi. Get the Magellan TRX app on your phone or tablet, or go to www.TRXtrailhead.com on your PC to see the same map that comes in the device. We now have over 100,000 navigable OHV trails in our database, and many more in the basemap that are also routeable. So it sounds like the plans for this device is to continually develop it and provide updates to existing owners as it improves? Can you download standard .GPX files written for other devices? You definitely have my attention. Does it have single button press for marking a waypoint? I saw on one of the reviews that there seems to be an unused button on the device currently. How's the battery life and power draw when its plugged into a 12V source. My Nexus 7 when its being used as a GPS kills the battery after about 4 hours even when its plugged in to the 12V power socket. Correct, we update the software and map about four times a year. Those updates are prompted when available and take place over Wi-Fi. The current way to use GPX files is to upload them to your profile on our trip planning map website www.TRXtrailhead.com . Those tracks then sync to your GPS over Wi-Fi and are then navigable from anywhere. Waypoints are saved by tapping the waypoint button on the map screen. You are given a choice of icons to save, and there's also a voice memo waypoint function. That way you could talk about the best way to approach an obstacle, then send a link to your track via email or social media. Battery life is rated at 6 hours, and will run and charge when connected to 5v @ at least 2 amps. That means it's important to use the cigar lighter adapter that is supplied, since many cell phone adapters are less than 2 amps. Sorry I missed this post prior to today. The mention of "rock buggy" makes me think this thing is going to be outside or exposed a lot to dust, water, mud, ect. If that's the case, I would forgo any kind of laptop or mobile device and get a GPS unit built for use with ATV's or motorbikes. If you think you'll have at least some protection from the elements, get a mobile device (I prefer Apple phones and ipads because their software and hardware are solid and reliable) with a free or subscription navigation app (Hema, Garmin Earthmate, ect.). Most new mobile devices come with built in GPS units, but if you want better GPS signal, get a bluetooth or USB GPS plug-in or puck. The mobile device offerings for navigation apps are so good at this point, I wouldn't even bother going with a traditional laptop...my 2 cents anyways. wasn't aware Magellan had a product with a 7" screen for <$100? Sweet. Got a link? I would agree with most of this post and add that you should forego anythign with a spinning hard drive. Solid-state electronics only. I'd suggest going even cheaper on your hardware as it is quite likely to get damaged, especially in a 'rock buggy" or elsewise cost as much for hardware to lock it down / mount it in a useful position. Me, I used a 7" android tablet (samsung Tab 3(?) Lite REFURB. Had ok hardware specs, certainly good enough for vehicle nav etc, built-in GPS receiver, bluetooth so I can connect it to an OBDII dongle and use the Torque app to read and display vehicle computer sensor data AND I can fill the large card I put in the SD slot with music and movies for camp use. And I fabricated my dash mount from some scrap plastic. As described in the post I linked above. There's a seemingly infinite variety of options and methods. Mine cost me $79 for the tablet, $15 fo rthe OBDII reader, $10 for the 32?Gb card and about $20 for various apps. And my mount was essentially free. Something similar could be fashioned for about any factory dash. And could even be fashioned in a manner that could be ladder-clamped to a tubular frame. Besides paper maps and compass, a watchband mini-compass, my vehicle's built in compass, I carry three GPS-enabled devices. My iPhone, the shown android tablet. And an old(er) Garmin handheld (Legend C) (no offense, Magellan) that I keep around as a backup. I second the advice to consider a mobile or purpose-made outdoor device, for it's durability and weather resistance.